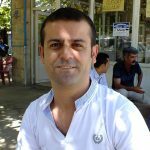 Amed Çeko Jiyan, whose official name is Mehmet Cemal Çelik, was born in the Kurtalan district of Siirt in 1980. He completed primary school in Kurtalan, secondary school in an Imam Hatip school, and high school in Kurtalan. He graduated from the Department of Electrical Engineering at Dicle University and enrolled in Elazığ University Metal Works Education but was unable to finish his studies. His first translation was a scientific article published in the first issue of a Kurdish magazine called Kulîlk. He was a pioneer in publishing Çirûsk magazine in 2004. Çirûsk lasted four issues, and featured his translations and stories. He was one of the founders of PCKurd and translated a number of computer programs into Kurmancî. Between 2008 and 2009 he was an editor for the children, interview, and literature pages of Azadiya Welat newspaper. In 2009 he spent five months working for AKNews in Erbil in the Kurmancî department. From 2011 to 2016 he was editor of books on culture and history published by the Diyarbakır Metropolitan Municipality Department of Culture and Tourism, translated materials of art lessons for Aram Tigran Conservatory. His stories, translations, and essays have been published in magazines and newspapers like Çirûsk, Kulîlk, Kulîka Ciwan, Kovara W, and Azadiya Welat. He has translated dozens of Aesop’s fables from English into Kurdish and published them in Azadiya Welat newspaper and in Peyv magazine.